For a short time, Annapolis was the Capital of the United States. In fact, the city was home to the Continental Congress, and the Treaty of Paris, which ended the Revolutionary War, was signed in Annapolis! Now it is not only a historic town but also a scenic tourist attraction on one of the prettiest water sites in the U.S. Of course, take a tour of the famous United States Naval Academy, but also come to visit the wharfs, the shops, the restaurants and all that is Annapolis! 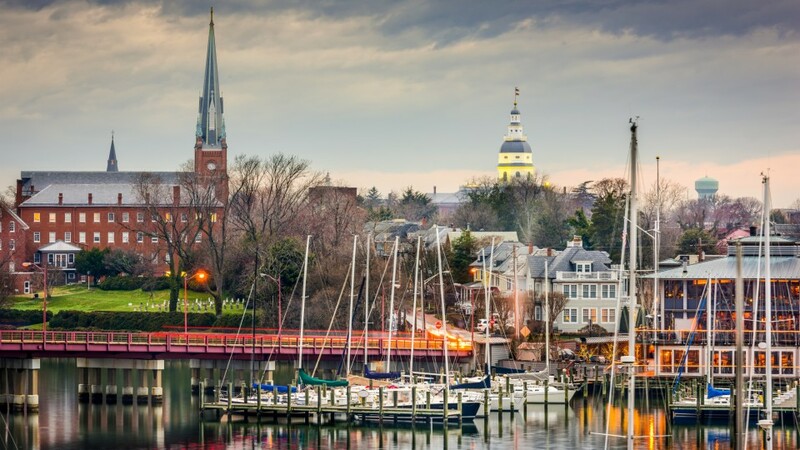 You can’t miss the amazing activities for everyone in the beautiful Annapolis, Maryland. This former state park is now owned by Anne Arundel County and is located on the Severn River. The Jonas Green State Park features a visitors center, environmental plantings, a fishing pier, and a cartop boat launch site. The Colonial Annapolis Historic District is located in the state capital of Maryland and was created a National Historic Landmark in 1965. Most of the downtown and harbor waterfront areas are included in this historic district which offers a plethora of dining, shopping, and more! Also known as the Thomas Point Shoal Light Station, the Thomas Point Shoal Lighthouse is located in the Chesapeake Bay section of Annapolis, MD. The original lighthouse was built in 1825 and later replaced in 1875 and has been active ever since. The Naval Academy Bridge crosses over the Severn River and runs adjacent to the United State Naval Academy. This bridge has quite a history in the town and is named in honor of the Naval Academy’s 150th anniversary. This three-story Georgian brick mansion dates back to 1769. The home was bequeathed for use as a home for elderly women in 1888 and is still being used today. While visitors cannot access the upper levels, the main floor and garden are open to the public. For more things to do in Howard County, MD, and surrounding areas check out the many opportunities awaiting you from Columbia, MD, to Washington DC and beyond!